Kim over at Life Over C's is having a wonderful Giving Thanks Giveaway! She has gift certificates plus 23 teaching products that she is giving away! I have donated my Christmas Cupcakes Compound Words Activity for Grades 1-3 to Kim's giveaway. Just click on the picture below to check out my product and click on the top picture to go to Kim's blog where you can see all the educational resources and enter the giveaway. Best of Luck and Happy Thanksgiving ! W!N Awesome Teaching Resources at Growing in 1st! Erin at Growing in First is having an awesome GIVEAWAY! She has 20 great teaching resources for PreK - Grade 2 to give away. Twenty TpT sellers have each donated a product and you can win ALL of them! My donation to Erin's giveaway is my new Santa Tally Marks Matching Games for kids in PreK - Grade 1. To see my donation, just click on the picture above. To see ALL the other donations and to enter the giveaway, just click on the top picture. Here is a simple and fun Thanksgiving Project to make with the kids. The kids can use the clock all month to practice their Telling Time skills. I found these turkey paper plates at the supermarket but you could use a solid color plate and have students draw a fun turkey in the middle. The felt numbers were purchased at a craft store (with a discount coupon). This particular set needed to be glued on the plate but most packages of numbers already have a sticky backing. The clock hands were cut from craft foam purchased at the dollar store and the brass fastener was bought in a box at Staples but can also be purchased at supermarkets, drug stores, etc. Many students have difficulty learning to tell time with analog clocks, so providing them with a fun activity where they can make their own clock should be an incentive to practice this skill. 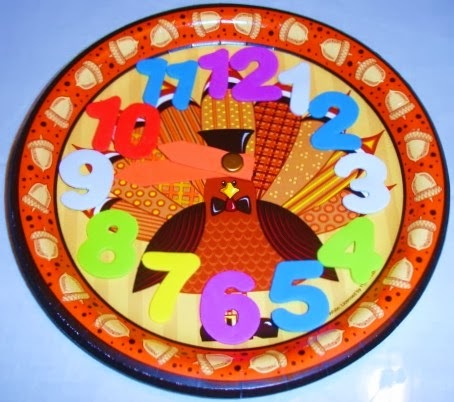 If you would like ideas for making other paper plate clocks with the kids plus resources for teaching kids to tell time, please click on the links below. Here's a fun little freebie for kids to fill in and color to demonstrate their fluency with addition. You can download this printable at my website. Just click on the picture above or on the link below. If you need a few more ideas and suggestions for other ways for kids to practice their addition facts, just click on the links below. It's time to put away the Halloween items and start to think of Thanksgiving! So here is my Free Even and Odd Turkey printable for the kids to color. They will need an orange and brown crayon. This math printable is about 3 digit numbers. This printable can be downloaded from my website. Just click on the picture above or the link below. If you would like to find a fun Thanksgiving turkey craft that you and the kids can make with a recyclable toilet paper roll, just click on the following link or picture.